Well, Team GrisGris, you did it. I didn’t think that legitimate comedic horror existed. I’ve seen comedic games and movies that parody the horror genre. And I’ve seen and played good horror films and games that aren’t afraid (no pun intended) to occasionally crack a joke. But I’ve never seen something that I could legitimately, at least in my mind, label a comedic horror. Or not one that was good, anyway. But that’s finally changed, thanks to Corpse Party: Sweet Sachiko’s Hysteric Birthday Bash. I’m not sure how a game could so masterfully make me go from laughing, to nervously holding my breath, and back to laughing so effortlessly, but this game has done it. A Corpse Party game, a game which is part of one of the most brutal and gut-wrenchingly gory horror video game franchises which I have ever played, has managed to perfect its brand of comedy — and I absolutely love it. 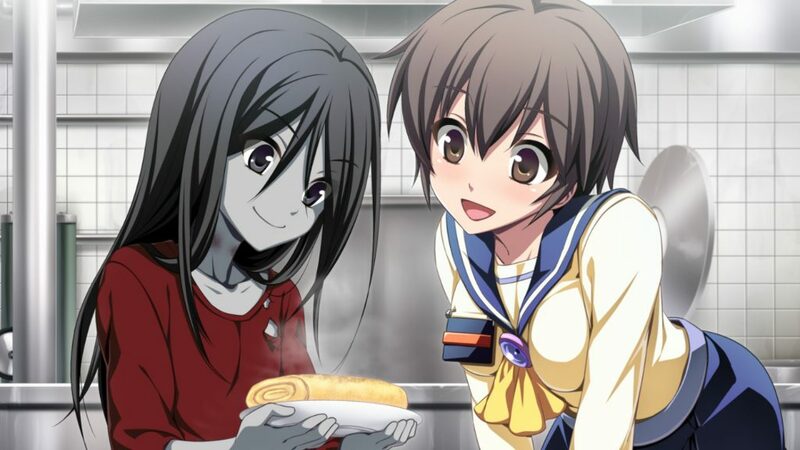 Corpse Party: Sweet Sachiko’s Hysteric Birthday Bash has more than surpassed my expectations (which were already fairly high, to begin with), and has successfully created its own unique niche — a fact which I’m very happy to be discussing throughout this review. How bad can a Birthday party be compared to everything else that’s happened? 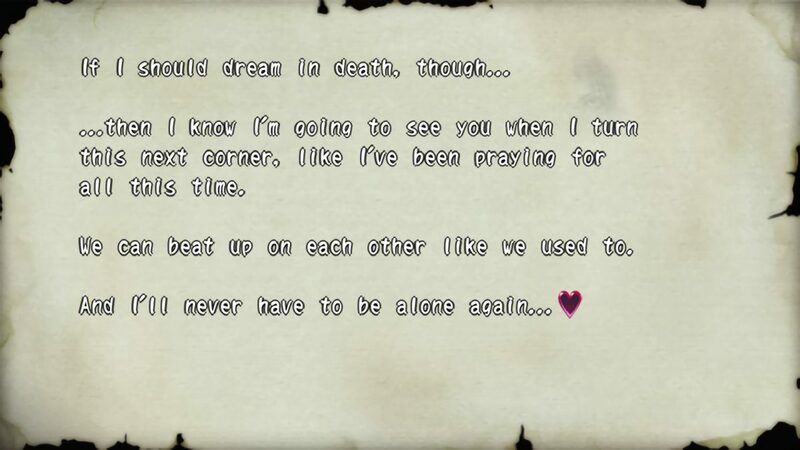 Those of you familiar with the Corpse Party series probably know what to expect from it by now. Emotional trauma, physical trauma, death, fear — all of that good stuff. What if I told you, however, that this game didn’t have any of that? Well, actually, no. That would be a lie. It has all of that. But what if I told you that it wasn’t the primary focus? That, instead of being terrifying, Sweet Sachiko’s Hysteric Birthday Bash was hilarious (but still pretty frightening)? Well, regardless of what your answer is, it’s true. This game is an honest-to-goodness comedy. 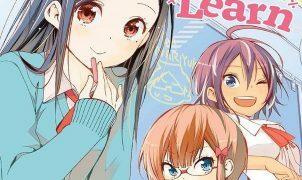 Rather than focusing on those trapped in Heavenly Host succumbing to a slew of horrors while attempting to escape, SSHBB focuses on a Birthday party. Sachiko’s Birthday party, to be exact. You see, this game begins on none other than the day of Sachiko’s “seventh” (she doesn’t actually age, you know) Birthday. And, rather than torturing everyone per the norm, our titular girl in the red dress instead decides to host a big ol’ Birthday bash — and everyone in Heavenly Host is forced against their will to participate invited! Of course, with as many friends as she has partying it up, Sachiko needs to make sure that her party is the biggest and best one yet. And thus, with a smile on her face, and nothing but happiness and benevolence in her heart, Sachiko sets out to ensure that her Birthday is the happiest and most fun one yet. Will you die laughing, or just die? Probably both! Corpse Party has always had a superb narrative, significantly aided by the high quality of both the overarching plot and the characters themselves. However, Sweet Sachiko’s Hysteric Birthday Bash excels at showing just how great the folks over at Team GrisGris (guest writers included!) are when it comes to their craft, and is also a testament to XSEED’s localization prowess (I saw and appreciated your creative liberties, guys). As a comedy, this game is genuinely funny — a compliment which I mean very sincerely. 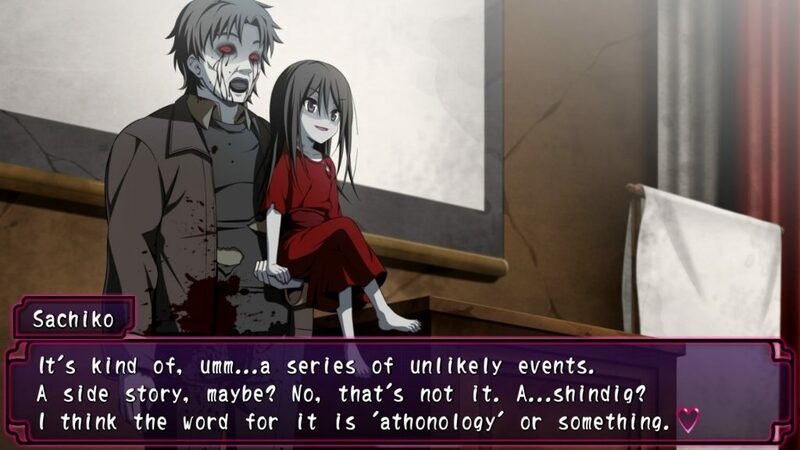 Just as the rest of Corpse Party does with its horror, Sweet Sachiko’s Hysteric Birthday Bash makes excellent use extended suspense and well-executed shock to deliver a set of stories that are not only comedic but comedic in different ways (a fact which is most likely due to this game’s multiple writers). From gags and puns to witty jokes and clever references — both to itself and outside entities — I honestly don’t think that I’ve laughed at a game this much in a long, long time. 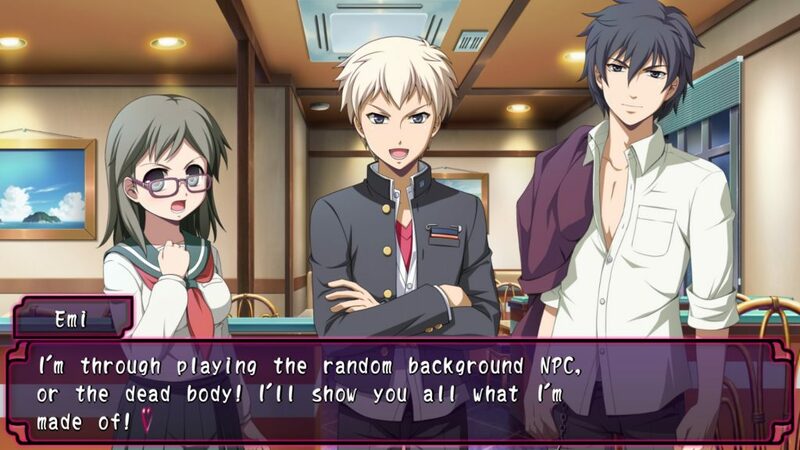 Another reason why I found this game to be so funny is that I know what Corpse Party actually is. It’s scary, disgusting, thrilling, and unabashedly nihilistic, and toys with players in the same way a cat would with a mouse just before delivering the killing blow (something which this game is all too comfortable with doing). The fact that the characters are making jokes, engaging in friendly(ish) competition, and even finding themselves in risqué situations still isn’t enough to make me forget that they’re all victims. Some of them have killed. A lot of them have been killed. And almost all of them are scared out of their wits. Regardless, they’re all still having as much fun as possible, even though, because this is Sachiko’s party, one wrong decision could mean the difference between getting kissed or getting killed — and despite the fact that they’ll all go back to being entirely miserable the next day. In a way, the constant false hope that this game exudes is almost a form of ironic, albeit highly effective, psychological torture in itself — and how its carried out is nothing short of spectacular (in terms of the narrative speaking, of course). Continuing the spin-off tradition set in place by Book of Shadows, Sweet Sachiko’s Hysteric Birthday Bash once again foregoes the adventure game formula and instead chooses to go full-on visual novel (no first-person exploration this time!). Because of this, there isn’t a whole lot to talk about in terms of actual game mechanics. Gameplay consists of your usual VN flare, promoting a mostly hands-off approach and only calling players into action when a decision needs to be made. Of course, these decisions aren’t to be taken lightly — even the weird ones (of which there are plenty) — as Wrong Ends are still quite plentiful in this game, and obtaining a Clear End isn’t always so easy. Fortunately, despite any potential trickiness which may arise, Sweet Sachiko’s Birthday Bash doesn’t go out of its way to make things too complicated (except maybe with the EX Chapter), ensuring that players find a delicate balance of challenge… as far as VNs go, anyway. Also taken from Book of Shadows is the fact that this game doesn’t take place as a single, overarching story, but instead chooses to segment itself into several chapters. These chapters, in turn, all feature a unique story — with help from several guest writers, this time around — although, unlike with Book of Shadows, these chapters (save the extra one) each run subsequently. Personally, I’m not overly fond of games that segment their portions as much as this one does. I didn’t, however, find myself minding it with this game. Because of its unique nature, and how it wanted to present itself to players, complete segmentation via chapter-based gameplay ultimately ended up working out in its favor. Each chapter carries itself on its own two metaphorical feet, and always cleans up nicely by the time it ends, and, because there are so many writers this time around, I don’t see any better way of doing it than this. A sweet story for a sweet Birthday. Sachiko may be going all out for her Birthday, but it isn’t a real Birthday party without party favors. And, while Sachiko herself may not be handing anything out to her guests, Sweet Shachiko’s Hysteric Birthday Bash itself makes sure that players have plenty of goodies to enjoy. Tucked away nicely within the game’s Bonus section are a number of, well, bonuses, for players to enjoy. Most of these bonuses come in the form of some kind of lore — including character dossiers, journal entries, and even a relationship chart — and are all incredibly interesting (if only morbidly so) to read through. The game’s also got you covered if you’re in the mood for something lighthearted, though, and once again features brief messages from each of the game’s voice actors. While not related to the story in any way whatsoever, listening to what each of the VAs had to say about their experience with the game was a lot of fun, and felt like a very nice end-game reward. I’m sure that I’ve made it painfully obvious by this point, but, just in case, I’ll say it once more; Corpse Party: Sweet Sachiko’s Hysteric Birthday Bash is genuinely a one-of-kind game. Proudly stepping outside of its comfort zone while remaining firmly rooted in its horrific point of origin, this is a game which so skillfully switches from funny to frightening that I don’t think that I’ll ever find another like it. Would I ever want to attend Sachiko’s Birthday myself? Hell no. I like being alive, thank you very much. But I’d be more than happy to attend it vicariously through this game again, and again. Full disclosure: This review is based on a copy of Corpse Party: Sweet Sachiko’s Hysteric Birthday Bash given to Hey Poor Player by the publisher.